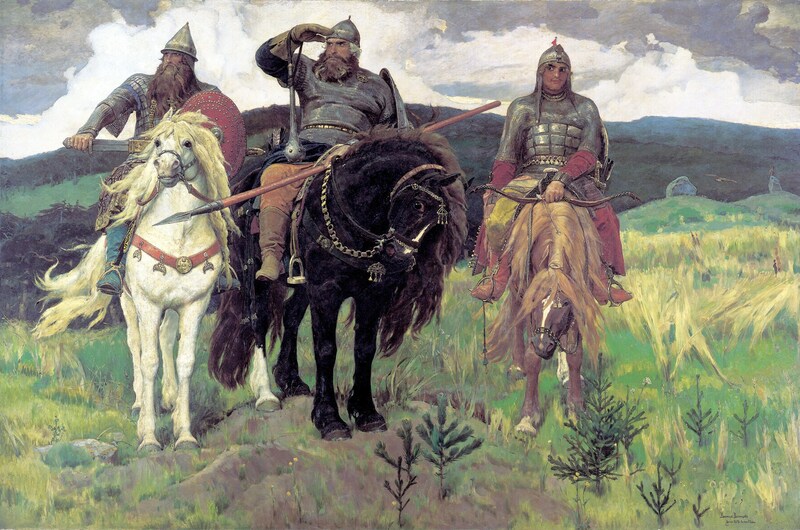 Here is a rather famous painting by the Russian artist Viktor Vasnetsov of three famous bogatyrs: characters from Russian literature akin to knight errants. On the right of the painting is Alyosha Popovich, the youngest of the three, who is known for killing a monster named Tugarin for insulting him at a feast. On the left is Dobrynya Nikitich, who slew the three-headed dragon Zmey Gorynych. And in the center is the most illustrious bogatyr of them all, Ilya Muromets. Just a beautiful work of art depicting three great and illustrious figures of Russian folklore. This entry was posted in The Good by DBreitenbeck. Bookmark the permalink.